Hi everyone! I am pleased to announce that I have joined another Design Team - Fab 'n' Funky Challenges! This is a weekly challenge blog with weekly themes and weekly sponsors and an opportunity for you to win great digital images from our sponsors. Our challenge for this week is.. This week our lovely sponsor is STITCHY BEAR'S DIGI OUTLET. 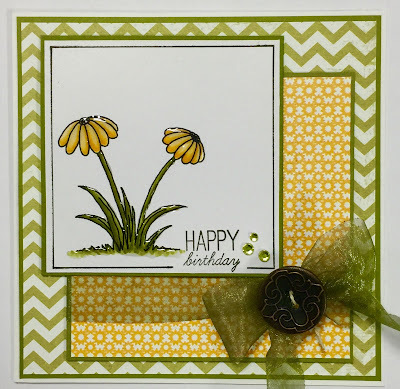 For my inspiration card I have used the cute little "Spring Flowers" image. I have coloured the image with Copics and then for some dimension I have applied Glossy Accents. Lovely DT card for the challenge this week Kristina, gorgeous Spring colours and image. Welcome to the team. Hi Kristina, and welcome to the team. Such a pretty image , gorgeous Spring colours and a fab layout on your card. Hello Kristina, welcome to our team :) love your card, it's absolutely beautiful! fabulous colours and design. How stunning. Simplicity and beautifully crafted. Fabulous card Kristina, love the sweet image, the LO and the colours, a lovely hint of spring to come! Welcome to the team!